Even though HQube is just a simple advertising-supported application, many computer users decide to keep it on the system because it promises to convert YouTube videos to highest quality format. Unfortunately, it does not seem that HQube will act as promised, which is why we do not think that it is a good idea to keep it on the system. If you have still decided to let it stay, you should know that you will have to deal with various commercial advertisements generated by HQube. Unfortunately, there is a very huge possibility that these commercials will not allow you browse the web and do your daily activities freely. These are the main reasons why you should delete HQube from the system. HQube itself acts very similarly as previously published applications that promise to enhance your video watching experience, for instance, Cinema-Plus and YourClip-HD. If it happens that you ever detect any of them on the system, you should delete them as quickly as possible. If you wonder why it is so, you should know that any of the aforementioned applications, including HQube, might cause harm to your system’s security because ads that they generate might route you to untrustworthy websites. Unfortunately, it is not known what you will find on them, which means that there is a possibility that you will come across malicious software there. 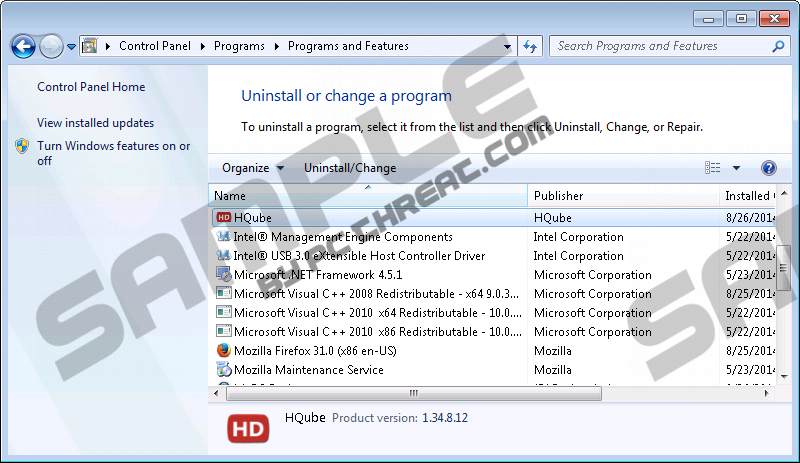 It is not very likely that you have download and installed HQube yourself because this program does not have its official website. Thus, it can be suggested that this advertising-supported application travels bundled with some kind of unreliable applications. Thus, you should be very cautious and never download programs from doubtful websites. Keep in mind that there might be much more serious infections out there, which is why you should make sure that your computer is protected. Our security specialists advise you to install a security tool on the system and keep it enabled all the time. It is necessary to eliminate HQube from the system if you do not want to experience security-related problems. We care about your system’s security, which is why we have prepared the manual removal instructions for you. Of course, you can delete this adware automatically as well. For this matter, we recommend acquiring SpyHunter. Of course, it is not forbidden to use another application; however, we suggest that you make sure whether it is completely reliable. Find HQube on the list and right-click on it. Quick & tested solution for HQube removal.